I have been collecting pieces of Franciscan Desert Rose dinnerware since the 1950's. 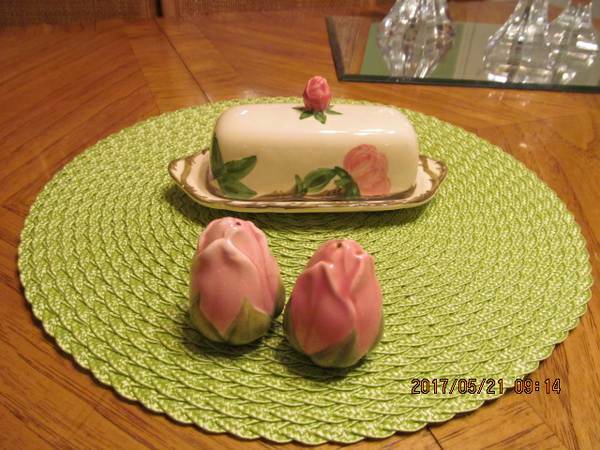 In this listing, I am selling the covered butter dish for $40 or best offer, and a salt and pepper set for $40 or best offer. These pieces are in very good condition. I will sell them separately as well. See the photo for more details. Please also note that I have another salt and pepper set, so if you are interested in that set as well, let me know and I will work with you on the price if you buy it, too.